Your bathroom is your private area. It’s a space in which you can enjoy time in peace and tranquility during a long bath or while doing your morning routine. Like with any home renovation project, any upgrades you make to the space should be well-planned and expertly executed. Whether it’s a large, luxurious shower space or a stylish new flooring, there are five significant factors that can take your bathroom from average to extraordinary. One of the critical elements of any bathroom upgrade is durability. This is especially important when considering your flooring options. Marble, ceramic and stone are each great choices for durability and water resistance. Try to select products that will resist staining and cracking. Bathrooms are often filled with warm, moist air, and your flooring should be designed to retain its optimal condition despite the environment. One large, stylish mirror over a sink area can be utilized to bring together the bathroom space. Often, a bathroom renovation involves the integration of multiple mirrors, which then detract from any otherwise stylish design. Use one mirror well instead of many mirrors poorly to keep a rich look to the space. Old shower curtains rarely retain their style and never retain their cleanliness. They quickly become dirty from built-up contaminants in both the air and water. Instead, upgrade to a bath screen. They can be easily wiped clean when they becomes dirty over time. There was a time when most bathrooms were covered in carpet material, but we’ve since come to realize that carpet offers little protection against water and is prone to staining and molding. Replace all carpeting with durable floor tiles to achieve a low maintenance, stylish bathroom floor area. The ultimate bathroom upgrade is a new shower. Power shower units can actually add inherent value to property and provide homeowners with a comforting space in which to enjoy those quiet evenings at home. There are numerous models available, and the latest shower equipment is exceptionally easy to install. When choosing new shower features, think about what is used the most. Do you have small children who could benefit from a new tub? Multiple adults who keep the shower running at all hours of the day who could save money with a low-flow showerhead? Luxury-minded people who would enjoy an automatic shampoo dispenser? Consider the needs of those in the house before starting your renovations! 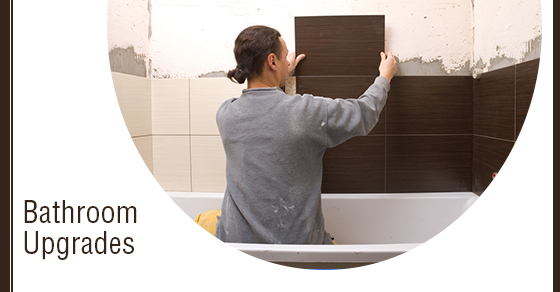 By reviewing the preceding tips and analyzing your bathroom renovation requirements, you can create a space that improves your home while adding long-term value. To learn more, speak with one of our renovation specialists directly.